That close to the sun, the spacecraft will face 500 times as much solar intensity as a spacecraft orbiting Earth. According to NASA, the spacecraft will collect data about solar activity , which will help scientists forecast major space-weather events, such as solar flares that impact life on Earth. These solar flares, or eruptions of high-energy radiation from the sun, can damage satellites and power lines. The primary goals for Solar Probe Plus include tracing the flow of energy from the corona, as well as understanding the heating of it. The mission will also investigate how solar winds (streams of charged and energetic particles flowing from the sun) are accelerated. And remember that dismal black “hole” growing on the surface of the sun? 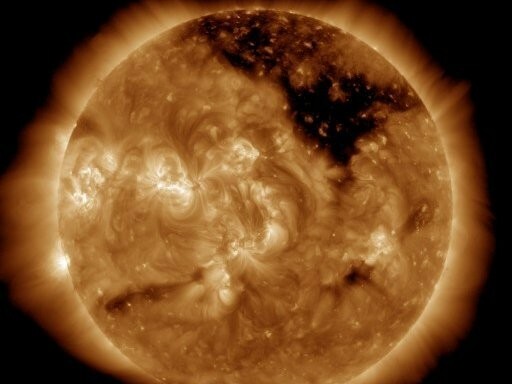 NASA hopes to investigate features like it on the sun, which can produce solar storms that are so dangerous to our electronics that “ scientists fear civilization could be sent back to the dark ages if a large blast were to strike the Earth,” Inquisitr reports. Scientists have been dreaming of a mission like this for 60 years, and today’s technology will finally allow it to happen. The probe will carry instruments allowing scientists to study magnetic fields, plasma and energetic particles, as well as image the solar wind. A 4.5-inch-thick carbon-composite shield will protect the probe from the sun’s sizzling temperatures (which can reach nearly 2,500 degrees Fahrenheit), miraculously keeping its insides at room temperature. "Solar Probe Plus is a true mission of exploration; for example, the spacecraft will go close enough to the sun to watch the solar wind speed from subsonic to supersonic, and it will fly through the birthplace of the highest-energy solar particles," JHUAPL wrote on the mission website . "Still, as with any great mission of discovery, Solar Probe Plus is likely to generate more questions than it answers."